The Deputy Chair-Person of the DIE LINKE party, used to be - in the GDR - a controversial communist; today she is the most famous politician of the left. In her new book "Wealth without Greed", she quotes ordoliberal thinkers as well as Karl Marx. One of the most outspoken Frau Merkel’s critics and political opponents, she has made very clear the reasons of her stand to the very respected and influential weekly DIE ZEIT. DIE ZEIT: Frau Wagenknecht, is Brexit a danger for Europe? Sahra Wagenknecht: It could also be a wake-up call. Everyone should now be aware that we must change something if we do not want Europe to fall apart. DIE ZEIT: What is wrong in Europe? Sahra Wagenknecht: The great promises of united Europe were peace, democracy and prosperity for all. In the EU treaties, on the contrary, capital freedoms have priority over social fundamental rights. For years we have been experiencing the unleashing of markets, social degradation, precariousness of labor, growing inequality. It is not surprising that more and more people turn away from such a Europe. DIE ZEIT: Was the euro also a mistake? Sahra Wagenknecht: Yes, it has split Europe. And it leads to greater and greater imbalances. Germany has huge export surpluses, while southern Europe is becoming deindustrialized, and millions are unemployed. DIE ZEIT: Can a common currency work in Europe at all? Sahra Wagenknecht: A single currency assumes that all participating states pursue a similar economic policy, ie, for example, wages develop similarly. That’s not the case. DIE ZEIT: In your discomfort you sound like Nigel Farage, who was the head of the right-wing populist Ukip in Great Britain fought for Brexit. Sahra Wagenknecht: Ukip people do not want a society based on solidarity. There is a single point about which I think they are right: their criticism of the EU democratic deficit. DIE ZEIT: You grew up in socialism without real democracy. How was your childhood? Sahra Wagenknecht: I grew up with my grandparents because my mother was working and my father had returned to his home country, Iran. I had a happy childhood, even though I was much alone. Only when I came to the teenager, my dissatisfaction grew. DIE ZEIT: Did socialism make you unhappy? Sahra Wagenknecht: I was not unhappy under socialism, but under what was called socialism in the GDR. I have read Marx, and I have noticed how little the GDR has to do with its ideals. So I have criticized: I wanted an attractive socialism that does not need a wall, so that people can stay – but to which everyone wants to. And I wanted open debates instead of petrified rituals. DIE ZEIT: How did your criticism come about? Sahra Wagenknecht: With this criticism, the GDR could handle even less than with a pro-capitalist. My articles for the wall newspaper in the school have been cut off. I was regarded as an unreliable loner. DIE ZEIT: What are the consequences? 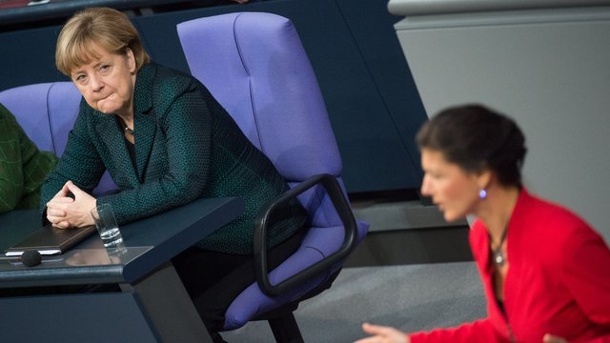 Sahra Wagenknecht: I was a good pupil – nevertheless, I did not get a place to study, but should work as a secretary. But I had already begun to read Aristotle, Leibniz, Kant, and Hegel. I wanted to go further and did this in self-study. DIE ZEIT: How should we imagine this? Sahra Wagenknecht: I canceled my job as a secretary and then earned my living expenses with tutoring lessons. Otherwise, I’ve read the whole day. In order to understand Hegel, for example, Georg Lukács became my virtual lecturer. Hegel helped me to understand the ancient Greeks. But without any chance of exchange and discussion with others, such a course is of course very difficult. DIE ZEIT:: In spite of this, you have just joined the SED. How does that fit together? Sahra Wagenknecht: I wanted the GDR to change. I was afraid that with their end all hope for a reformed, attractive socialism would be discredited and settled. When the wall fell, I sat alone at home, and was reading Kant. Sahra Wagenknecht: That’s right. Capitalism gave me a better life. But today, it means for many people a life of great social insecurity and with extremely unevenly distributed opportunities. DIE ZEIT: What is particularly disturbing to you? Sahra Wagenknecht: It is unacceptable for people in such a rich country as Germany to need a second or third job to survive, or that even after a long working life, many people face poverty. There is no reason to deal with such circumstances. DIE ZEIT: After all, unemployment in Germany is as low as in 25 years. Sahra Wagenknecht: Yes, but more people than ever have precarious jobs from which they can not live: badly paid, temporary, part-time or minijob. A good four million employers are still dependent on Hartz IV. DIE ZEIT: In Germany, people are being pulled back and forth in the refugee question. They have spoken out months ago for the upper limits of refugees. Sahra Wagenknecht: Those who are persecuted politically in their homeland must be given asylum, since every upper limit would be cynical. But, of course, capacities are not unlimited, and very high immigration leads to greater competition on the labor market and on the housing market. This is particularly true of the poor, who have been abandoned by the ruling politics for years. If we do not take their fears seriously, not a few drives to the right. DIE ZEIT: In the arms of the right-wing extremists of Alternative fur Deutschland. Sahra Wagenknecht: Angela Merkel’s unpromising policy has created much uncertainty. Without them, the AfD would not have experienced its heights. Merkel, of course, has a co-responsibility for Brexit and the growing nationalism. The “German Europe”, of which Kauder once raved, is a nightmare and water on the mills of Le Pen. DIE ZEIT: You also said: Who abuses guest law, forfeits it. Is that the voice of reason or the populist? Sahra Wagenknecht: I did not repeat the sentence, because it was misunderstood as a rejection of the right of asylum. I simply meant that when we take people and provide them with protection, we can also expect them to respect our rules. DIE ZEIT:: In the country elections this year, it was the left that lost most voters to the AfD. Sahra Wagenknecht: In Saxony-Anhalt, we made a state-run government election campaign and hardly attacked the federal policy. We have made too little clear that we are concerned about the social interests of the people, and have been perceived above all as a pro-refugee party. DIE ZEIT: In your book, you are sketching ways to fight poverty. They want to replace large banks with smaller commonwealth banks and also other corporations through new corporate forms. Does it need a revolution? Sahra Wagenknecht: No, democratic decisions. Overcoming capitalism does not mean fully-state-building and planning. With the company structures I propose, the markets do not work worse but better. We do not replace the incentive, but create meaningful. DIE ZEIT: Imagine, you will be Chancellor. What happens then? Sahra Wagenknecht:: There are crucial areas which should be taken out of the market: education and health care. We also need public housing and a restoration of the welfare state. DIE ZEIT: Do you want to socialize the banks? 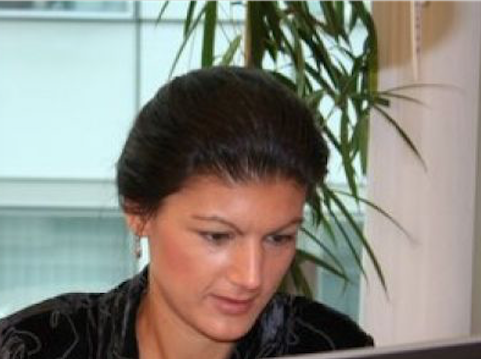 Sahra Wagenknecht:: In the financial sector, all market principles are overridden. Private institutions are collecting huge profits when things are going well – and the State, including the central bank, is always ready as a liable third party and free guarantor. This enables a business model that would not work in a free market. Today, no one would have a euro in an account with Deutsche Bank, if one did not know that the state would never let it go bankrupt. DIE ZEIT: What would be the alternative to the euro? Sahra Wagenknecht:: A system such as the one Keynes suggested decades ago. The euro would be an anchor currency and the national currencies would be stabilized by a European monetary authority. In the case of major imbalances, a country would have to devalue its currency. If such reforms do not exist in the euro area, some countries will leave the Eurozone. Share Wagenknecht: The first candidate would be Italy. The country has lost nearly 10 percent of its economic power and 25 percent of its industry in recent years. With its inflationary lira earlier, unemployment was much lower, and there was growth. DIE ZEIT: Despite such massive criticism, you are now firmly part of the establishment. Doesn’t this worry you? Sahra Wagenknecht:: Which establishment? I think I have more acceptance than before, but that is something different. DIE ZEIT: Have you specifically addressed economic issues? Sahra Wagenknecht:: The economy depends on how a society develops, how much prosperity it allows. For me, it is therefore a central question as to how our Economic Regulation can be both productive and innovative without leading to growing inequality. Answers I have also found among Ordoliberals like Walter Eucken and Alexander Rüstow: They were convinced that individual corporations must never concentrate too much power on themselves. DIE ZEIT: Did you secretly convert to the liberal? Sahra Wagenknecht:: The limitation of economic power is also the central concern of the left. The same applies to values such as equal starting odds and performance. DIE ZEIT: Is performance seen as a value by left? Sahra Wagenknecht:: Of course. It is the the neo-liberals that devalue it. In Germany, there are many people who do a lot of work – nurses, health assistants – and they are miserably paid for. And there are people who earn an incredible amount of money in business investment banking or as a consultant for tax breaks, (with shops that harm the general public. DIE ZEIT: Do you trust the market economy to change that when you set the right rules? Sahra Wagenknecht:: The market economy, yes, capitalism does not. Markets are irreplaceable for a modern economy. But we do not need any companies as cash cows for financial investors or inheritance dynasties. DIE ZEIT: How would young Sahra Wagenknecht, who wrote the essay Marxism and opportunism in 1992, read your new book? Sahra Wagenknecht:: At that time I still thought that we need a goal-planned economy with state property. But one thing has not changed: I was convinced at that time and it is still today that humanity deserves a better order than capitalism. DIE ZEIT: You present your ideas to bankers and your book with political opponents. Why? Sahra Wagenknecht: When I talk to people who are not of my opinion, I am intellectually challenged, and I can better find out how far my arguments bear – especially as I often discover coincidences. Entrepreneurs who do not come from rich families know many of the problems I am describing: They know how hard it is to get a start-up loan or to hold their own inventions against patents. DIE ZEIT: On Facebook and on Twitter you have more followers than all the other politicians of the left. Are you now the face of the party? Sahra Wagenknecht: Political parties need people with whom people can identify. But I am not the face, but only a face of the left. DIE ZEIT: What do you do with the fruits of this brand, ie with the money, the plays and books? 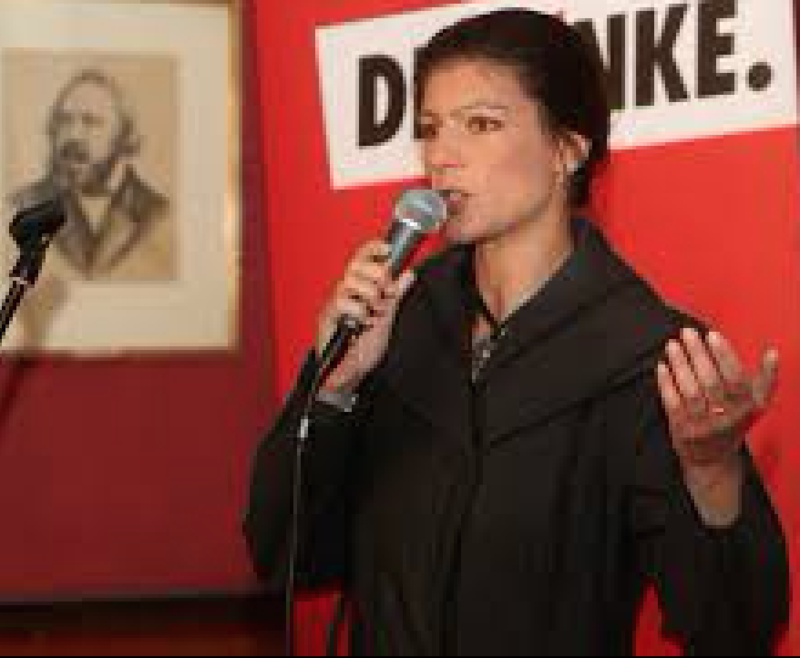 Sahra Wagenknecht: I donate for social initiatives, for left blogs and of course for political work. DIE ZEIT: Do you encounter envy? When you go to Sahra Wagenknecht, the search engine suggests the concept of private wealth. Sahra Wagenknecht: There you are. I am not so rich. DIE ZEIT: As a young woman you were really poor. Does this still work today? Sahra Wagenknecht:: Yes. It still hurts me to waste money. I would never spend 1,000 euros for a handbag, because I think the crazy. If you do not pay attention to money, you can lift it off – and I will not. DIE ZEIT: How can one be so happy when one is so concerned about the state of the world?